The Ninth Judicial District Commission on Judicial Performance unanimously recommends by a vote of 10-0 that Judge Erin Fernandez-Ely BE RETAINED. Judge Fernandez-Ely received a Bachelor of Arts in Philosophy from Wellesley College in 1973. She received her law degree from the University of Florida in 1975. 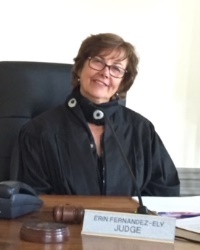 Judge Fernandez-Ely was appointed as the Pitkin County Court Judge in January 2000. Prior to her appointment to the bench, Judge Fernandez-Ely worked as a prosecutor in Palm Beach County, Florida, and then in private practice in Aspen. She created a pretrial case management program for the Pitkin County Court and helped establish the mental health “wellness court” in Aspen. Her community activities include work with a mock trial program for middle school children and serving as a trustee for the non-profit Aspen Waldorf Foundation. Attorneys and non-attorneys rated Judge Fernandez-Ely’s judicial performance on a scale from 0.0 (lowest possible score) to 4.0 (highest possible score). The overall average grade from attorneys was 3.42, and the overall average from non-attorneys was 3.31, for a combined overall grade of 3.37. The average combined grade for all county judges standing for retention in 2014 is 3.43. Both attorneys and non-attorneys overwhelmingly recommended that she be retained. In addition, members of both groups commented that she exhibits intelligence, experience, compassion, understanding, and patience and treats litigants fairly regardless of whether they have attorneys or not. Some respondents felt that she exhibited bias towards some criminal defendants, but others felt that she exhibited bias towards the prosecution. Several respondents commented that Judge Fernandez-Ely encouraged the parties to compromise and reach practical solutions to their disputes, which was viewed by some as a strength and by others as a weakness. Judge Fernandez-Ely expressed keen interest in the survey results and the Commission’s observations during the interview and showed a commitment to continued self-improvement in light of both positive and negative comments from the survey.